On-Campus Jobs Can Help You Pay for College — But Are They Right for You? Figuring out how to pay for college can get pretty stressful. Even if you apply for multiple scholarships, choose a college that charges significantly less than most and take advantage of savings plans, it’s possible you’ll still come up short. If you think you’ve exhausted your options, you might want to consider an on-campus job, which could help you scrape up extra funds to lower your bill for the semester. But are they right for you? Here’s how to find out. There are a variety of on-campus jobs, which can include work-study jobs. Work study is “a federal student aid program that provides part-time employment while you are enrolled in school to help pay for your education expenses,” according to the Federal Student Aid office of the U.S. Department of Education. In simpler terms, a work-study program is financial aid you receive if you’re willing to pick up a part-time job. These jobs are usually involve civic education or work related to your major. Most often, you’ll work for your university on campus, but in rare occurrences, you’ll work off campus — typically at a nonprofit or public agency. Other types of on-campus jobs are strictly hourly employment and are not funded by the government, but by the specific department the student may be working in. Examples of these types of jobs would be working in the library or at the front desk of a residence hall. There are also opportunities for students to work for a private company that’s on campus, like a Barnes & Noble bookstore. The type of on-campus job you get depends on what you’re eligible for and how soon you apply. If you don’t have access to a car or enough cash for an Uber or Metrocard, an on-campus work-study job could be a viable option. On top of saving some cash by being within walking distance, students also have the benefit of being close enough to not have to wait in rush-hour traffic during a commute — meaning more time to study! You can sometimes apply the funds earned through a work-study program directly to your bill — or you can be paid in even bigger perks, like room and board. Levy stated that some work-study opportunities, like a resident assistant position in dorms, could provide students with free housing — and maybe even meal plans. This could potentially reduce your student loans. Keep in mind, however, that you would have to find something else to generate funds for your living expenses, like an easy online job or side gig, since work-study jobs have limited earning potential. Katherine Lavacca, a first-year journalism MBA candidate at the City University of New York, had a great experience in a work-study program during her undergraduate career in Tampa. In addition to an off-campus job, Lavacca used an on-campus work-study job to work under a professor as a research assistant for his upcoming book. She was paid $10 per hour and worked about eight hours a week. She put this money straight toward her school costs. Another advantage of on-campus jobs is that when the school shuts down, your job usually does, too. This makes them great for students who want to go home for the holidays. Some common industries for off-campus jobs, such as the service industry, have their busiest seasons during those times, making it difficult to get time off. While there are some pretty enticing reasons to get an on-campus job, there are some disadvantages students should strongly consider before diving into one. According to the Federal Student Aid government website, how much you can earn in a work-study depends on your level of financial need — which means once you meet a certain threshold, you can’t earn more than that. On top of that, hourly on-campus jobs have lower wages than off-campus ones. And some on-campus jobs don’t even offer raises. 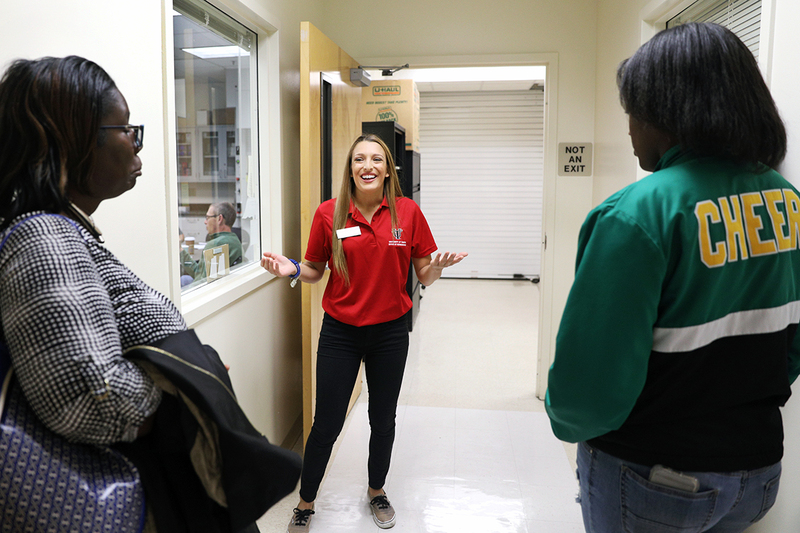 Savannah Wagner, a senior at the University of Tampa, sometimes wishes she could work an off-campus job for this reason. If you’re looking for work that allows you a disposable income, on-campus jobs might not be for you — you could serve tables off-campus and make twice as much (or more!). According to the U.S. Department of Education’s blog, universities have limited funds to award for work-study jobs — and those funds come at a first-come, first-serve basis. Just because a work-study shows up on your financial aid package doesn’t mean that you’re automatically granted it. Students must seek out on-campus employment themselves, and if they wait too long, positions may no longer be available. Aside from that, a campus can only offer so many jobs — and there probably isn’t one for every single student. Lavacca said students who have to financially support themselves should consider off-campus jobs instead of work-study programs. She said there are more job options off campus that could fulfill your interests and lead to what you want to do in the future. Even though an off-campus job can provide you with higher disposable income, it’s important to consider the field you choose to work in. Work-study jobs can relate to your course of study and could benefit you and your career in the long run. However, Lavacca also notes if students have financial help from an outside source, such as parents, staying on campus would be a better option. Staying on campus could lead to better relationships with professors and staff due to frequent interaction. You could go out and get an off-campus internship — but don’t forget to consider the cost of getting to and from it each day, and the time taken away from studying while you’re in transit. Overall? It depends on you and your financial and academic needs and goals — choose wisely! Your Turn: Have you participated in a work-study program? What did you think about it? Kelly Smith is a junior writer and engagement specialist at The Penny Hoarder and a senior at The University of Tampa. She always preferred off-campus jobs.